Many programs interface indirectly with Microsoft Excel, but some offer built-in functionality that you may not need or want. In other cases, an add-in that you rely on may suddenly vanish from Excel. In this article I'll explain how you can manage these features. Excel has long offered the ability for add-ins. For instance, Adobe Acrobat often helpfully adds a separate toolbar or ribbon tab. However, Excel 2007 and 2010 offer built-in PDF printing capability, so do you really need another handful of commands to create PDFs? Certain versions of Sage 50 (formerly Peachtree Accounting) and QuickBooks add extra ribbon tabs to Excel as well. This is great if you need these tools, but unwanted add-ins can cause Excel to take longer to launch, plus your Excel interface can become unwieldy, as shown in Figure 1. As shown in Figure 2, click on File, Options, and then Add-ins. Click the drop-down at the bottom and choose COM Add-ins, and then click Go. Enable or disable add-ins as needed, and then click OK as needed. The aforementioned steps should handle most add-ins that surreptitiously appear in Excel, but another place to check is the Excel Add-ins list in step 2 above. The steps are the same for Excel 2007, except you'll click the Office button in the top left-hand corner, and then choose Excel options. From there, follow steps 3 through 9 in Figure 2. In Excel 2003 and earlier, click the Tools menu, choose Add-ins, and then make your selections. From time to time, an add-in that you rely on may vanish from the Excel user interface or not function correctly. 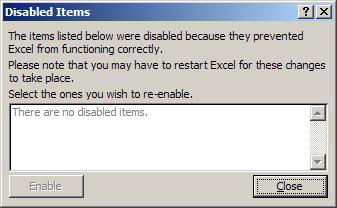 If Excel deems that the add-in has caused an issue, it will automatically place the add-in on a hidden disabled list. 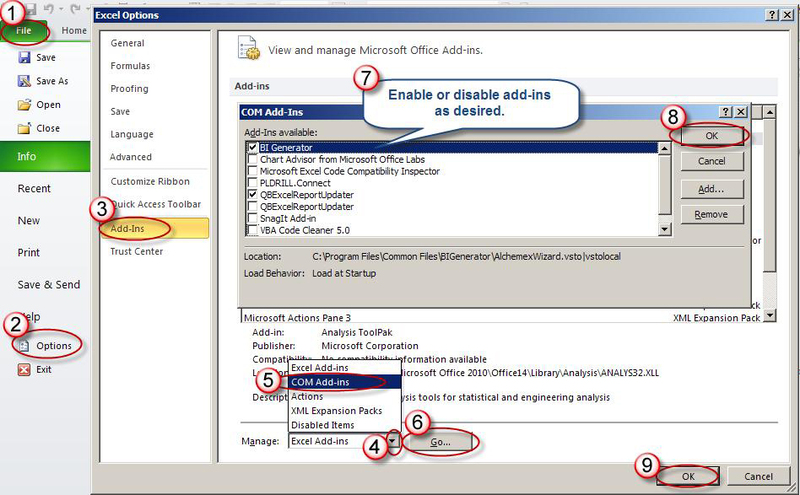 To determine if any add-ins have been disabled in Excel 2007 or 2010, follow steps 1 through 4 in Figure 2, and then choose Disabled Items in step 5. 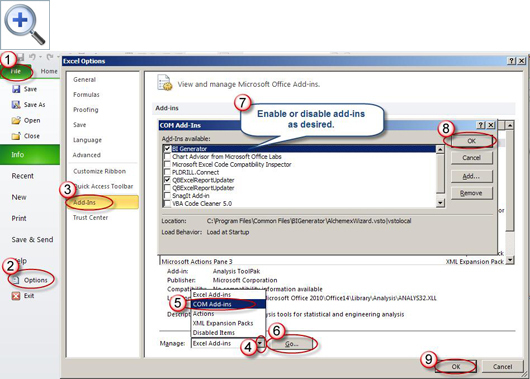 As shown in Figure 3, a prompt will appear from which you can enable any add-ins if necessary. In Excel 2003, click Help, About Microsoft Excel, and then click the Disabled Items button.